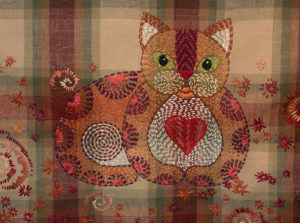 The last decade or so saw the rise of primitive wool stitchery and applique in the American quilting community. 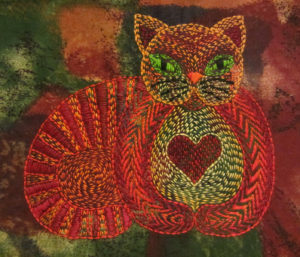 Initially, the trend was leaning to a style of Americana Folk Art but now with the rise of some stitchery superstars like Sue Spargo and Leora Raikin, other cultural inspirations have moved into the limelight, particularly African Folklore Embroidery. These embroidered panels originated in South Africa and feature images of people, animals and everyday objects rendered in a rustic style rendered with simple stitches. 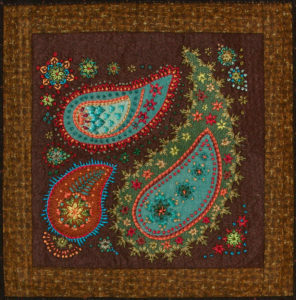 Another quilt artist embellishing her work with rustic yet exquisite stitchery is Yoko Saito whose book 120 Original Embroidery Designs features a wide range of embroidery patterns from quirky to elegant all rendered in her ubiquitous Taupe color schemes, published be Quiltmania. And I would be remiss if I did not mention another book – ‘Voyage Autour de la Laine’ (A Trip Around the Wool) by Ségolene Schweitzer, also published by Quiltmania. I, too, have explored and used primitive folk art as a springboard of inspiration since my youth. In the 1970’s, I was enthralled by art from India and the Middle East. My grandmother and great aunt and uncle traveled quite a bit and brought home trinkets and treasures from exotic places. I still have a painted wooden box embellished with a tapestry of wood-burning designs that my great aunt and uncle brought me when I was 12 years old from some eastern country; this box is used to distribute chocolate at my workshops. Another treasure that hangs on my wall is a carpet from Iran also presented to me by me great aunt and uncle. This carpet is not a traditional floor covering but rather one that had been woven as a tent divider, the pattern is identical on both sides and it is woven with a short still pile of camel hair. My grandmother preferred to travel in Europe and Australia and to this day, I regret that I had no interest in Aboriginal art when she passed away, otherwise I would have snatched up the few artifacts she had brought back from Australia, as it happened, I was drawn to the Chinese artifacts she had collected when she lived in Manchuria in the 1920’s. She dabbled in embroidery and it was a her knee that I first developed an interest in hand embroidery. Her inspiration included the textile arts of the Caucasus a part of Russia that was her homeland. My love of the exotic and ancient cultures has been a driving influence in my handwork, both with quilting but especially with embroidery. In my youth, Medieval art also was an influence and I explored trying to reproduce Medieval tapestries in hand embroidery though they were so large and intricate that I never actually completed one. I also explored Assisi Embroidery and made one complex piece after trying out some simple designs. In my younger years I used to make cross stitched designs reminiscent of Oriental carpets but rather than choosing a specific pattern from a book, I tended to simply start stitching with a geometric shape in the center and working my way out from that. Often, designs evolved based on the amount of embroidery thread or yarn I had at my disposal (I was a poor teenager working with whatever my babysitting money would buy). 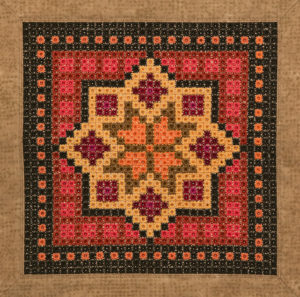 Last year, inspired by a woolen cross stitch pillow based on a Caucasus pattern stitched by my grandmother, I explored Algerian Eye stitch to make a similarly patterned medallion. Sashiko has been one of my passions for years now but recently, I discovered Kantha stitching. 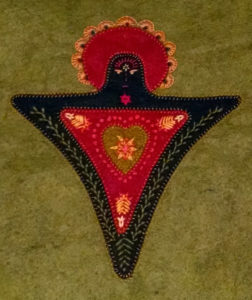 At its simplest, it is a form of coarse running stitch used in India to recycle worn Sari material into a new textile from which coverlets and pillows can be made (similar to Boro Stitching in Japan). At the pinnacle of Katha embroidery, intricate designs are stitched in a measured fashion often creating secondary textures like a brocade. 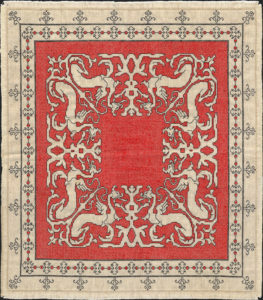 Subjects can range from images of elephants and peacocks to Paisley designs. Speaking of Paisley, some people view Paisley designs as Victorian and indeed they rose to great heights of popularity in that era but the other name they are known by – Persian Pickle – indicates their origins in Middle Eastern art. There is some debate as to what the motif represents, some sources say it is a fig others say it is a blending of a floral spray and a cypress tree. Whatever – it is undeniably botanical in origin. Appliqued Paisley designs are a prefect subject to embellish with intricate embroidery stitching. About a year and a half ago, I introduced my Journal Quilt class groups to Inlaid Felt Applique, a form of textile art used to make Shyrdak rugs from Kyrgyzstan. 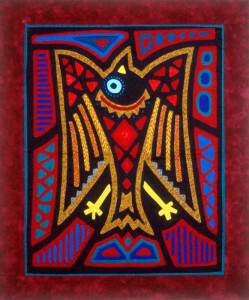 The felt pieces in these rugs are joined by hand with a heavy Herringbone embroidery stitch but I used machine embroidery to bridge the pieces of felt and concentrated on embellishing the finished applique with intricate hand embroidery; for a subject, I designed a very simple Southwest style angel motif. 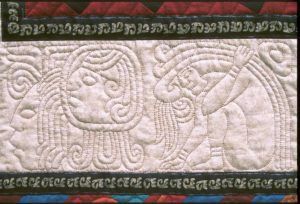 In the days when I had more time to indulge in Hand Quilting, I found myself drawn to the intricate glyphs and carvings of the Aztecs and Maya. These simply begged to be converted into hand quilting motifs. And finally, no discussion of hand stitched primitive textile art would not be complete without mentioning Molas from Central America. Made by the Kuna in the San Blas Islands, these colorful reverse applique featuring folk art motifs are often embellished with additional hand embroidery. There is a very wide world out there full of inspiration for those who have the curiosity and interest to follow the trail to wherever it may lead.